Fan culture. It’s essential to sports but often ignored by sport-focused organizations. For example, most of our focus to end homophobia and transphobia in sport has emphasized individual athletes and the climate on the field of play. Fan behavior, fan treatment and the LGBT climate in the stands, however, have been long-overlooked. And it appears it has been to the detriment of fan culture. A recent international study revealed that outside of locker rooms, the stands at sports events ranked as one of the most homophobic spaces. In fact, 83 percent of Americans felt that LGBT people were unsafe at sporting events. Given the crucial role fans play in the sports world and their value to the game, seeing these stats is both shocking and concerning. Further, legislatures across the country have been proposing and passing anti-LGBT ordinances at an alarming rate. Most of these laws would dwindle or eliminate the protections that LGBT individuals have in public accommodations, including sports stadiums and arenas. These laws would allow discrimination against any LGBT fan in attendance. So what about our fans? Until recently, there was no coordinated strategy or response to this problem. But in March 2016, in celebration of March Madness (one of the biggest celebrations of fandom), Athlete Ally launched the #EveryFan campaign. #EveryFan is a national fan-centric initiative that focuses on what it means to be a good fan and how sports are committed to every fan having a great experience celebrating teams and sport. The campaign encourages safety and inclusion for every fan at every sporting event, regardless of the fan’s sexual orientation or gender identity. Every athlete, fan, team and league are welcome to sign on and pledge to provide a safe and welcoming environment for every fan, particularly LGBT fans. Dozens of athletes and several teams across the country have already signed on to #EveryFan, including the Atlanta Hawks and Georgetown and West Virginia Universities. Several student athletes from Duke and UNC have already posted an #EveryFan video. The momentum for the campaign continues to build as more and more states attempt to pass anti-LGBT laws. LGBT sports organizing has come into its own over the past few years. More athletes are coming out and more sports corporations are supporting LGBT equality on the field. Now it’s time to turn to the stands and incorporate the fans. 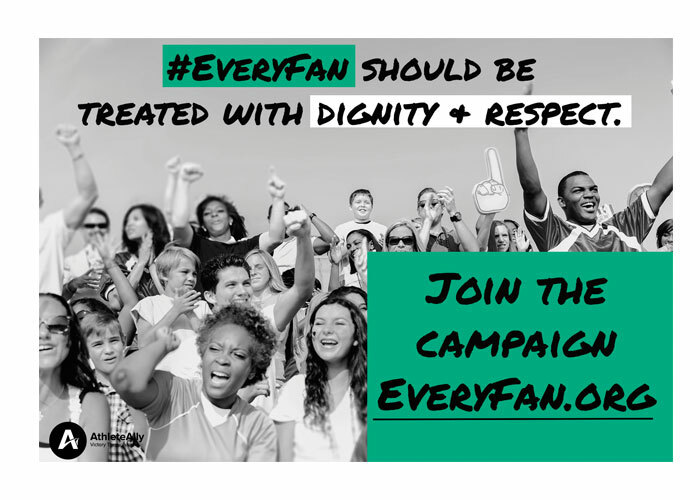 And the #EveryFan campaign is a major step in increasing the number as well as the safety of LGBT fans.